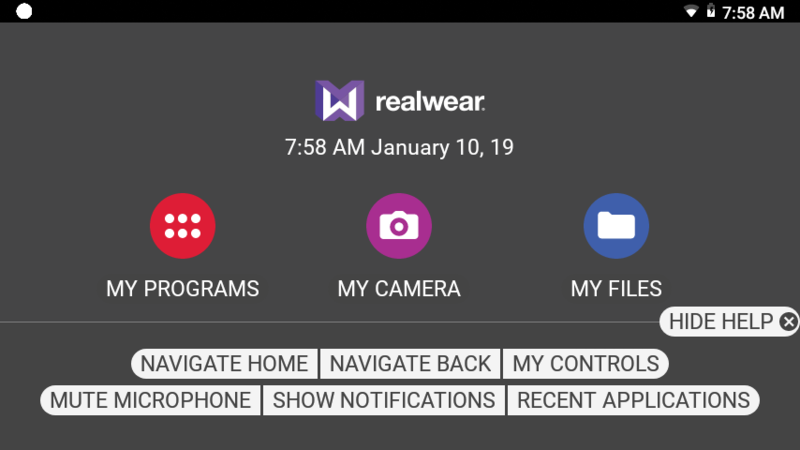 WearHF™ is an innovative software solution that enables you to use your RealWear HMT as a hands-free device. It is easy to use and loaded with intuitive functions. HMT devices operate based on speech recognition. Instead of pressing or tapping a control button on the screen, all you need to do is speak the name of the respective control. HMT devices use the latest technology for advanced noise cancellation and speech recognition which work even in the harshest noisy environments. It can recognize many different languages and accents and can detect the command even if you speak in a low voice. All the commands associated with the specific screen should be displayed clearly on the screen, usually in ALL CAPITAL LETTERS. You can operate the device by speaking the name of any control. For example, the Home Screen has large icons with respective names such a “MY PROGRAMS” or “MY FILES”. 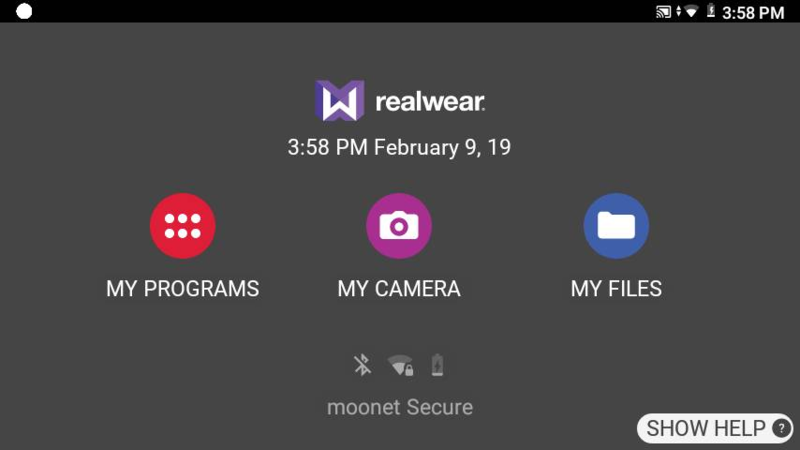 To access these applications, you can say the application name and the corresponding screen is launched. You can access the help information regarding the commands associated with a particular screen, with “SHOW HELP” command. The “SHOW HELP” command is displayed on all the screens. The help screen is displayed as a pop-up window. You can either say the command you desire or say “HIDE HELP” to close the pop-up window. Even when the help window is closed, the HMT-1 will continue to listen for and respond to those commands. Sometimes, the control on the screen has no name, is a scroll button without a label, or is a file with an unpronounceable filename such as 3454-x.pdf. WearHF™ automatically proposes an alternative speech command and assigns a number. This number is displayed next to the respective control on the screen. To recall the specific control numbers for that screen, say “SHOW HELP”. To select a specific control, use the number assigned to it. 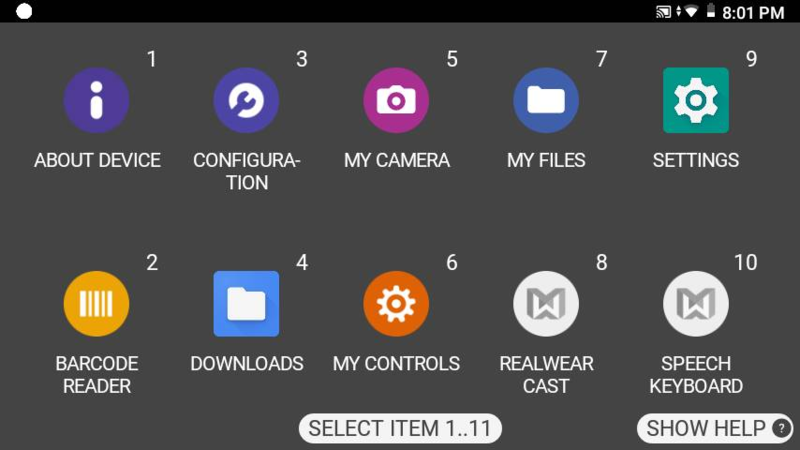 For example, you can say “SELECT ITEM 1” to select the item associated with number 1. Note the some command numbers might be hidden by a SHOW HELP command as it may bring up both the command label popup and the alternative speech command numbers. When you say “HIDE HELP” the command numbers will remain on screen for a moment in order to see those items behind the pop-up window. To stop the speech recognizer, say “MUTE MICROPHONE”. 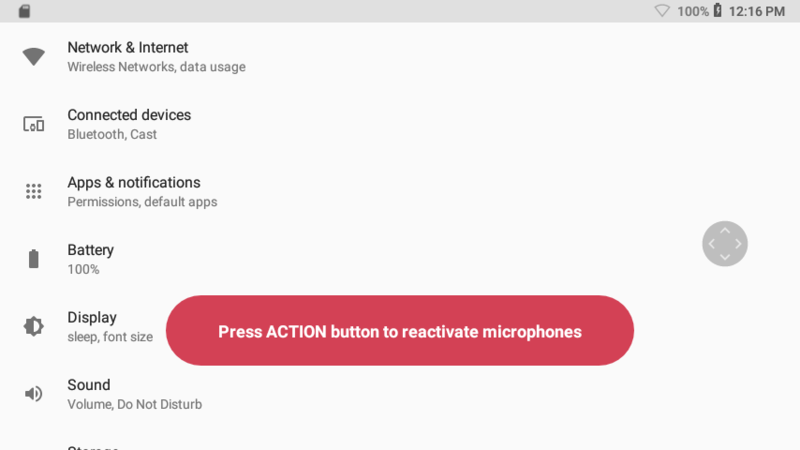 The device will not respond to your voice commands while the microphone is muted, and a red warning sign is displayed on the screen. To restart the speech recognizer, tap once on the Action button on the side of the device, located just in front of the Power button. On screens with scroll views, you can scroll using the following voice commands. “PAGE UP” Navigates to 1 page up. “PAGE DOWN” Navigates to 1 page down. “PAGE LEFT” Navigates to 1 page left. “PAGE RIGHT” Navigates to 1 page right. “SHOW HELP” Displays pop-up window with the help for commands associated with the current screen. For example, In Settings page, we can use voice command “PAGE DOWN” to scroll down and “PAGE UP” to scroll up.